With EA's Madden dropping the ball, American football Switch owners have nothing else to look forward to except Digital Dreams Entertainment unique take on the sport. 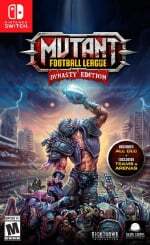 After the Switch version was revealed at E3, Mutant Football League has now been confirmed for a retail release on Nintendo's hybrid console, re-branded as Mutant League Football: Dynasty Edition. It will expand upon the already excellent amount of content with new modes, teams, and even new species. While we're aware the Switch occasionally gets slightly less than brilliant ports from time to time, it looks like this particular game will be something special. Thanks to Nintendo World Report having some hands-on time with the latest build of this version of the game, the following dozen minutes of docked gameplay confirmed that very little, if nothing at all, was conceded into bringing the bloody gridiron experience to the Switch. In the clip, the Orc of Hazzard visit the Leaveland Burns on their home turf, the First Energy Stadium. What a delightful showcase of utter unsportsmanlike conduct and a fantastic display of Unity Engine flexibility. We do hope after this one is successfully released, Mutant Hockey League is up next on the cards. 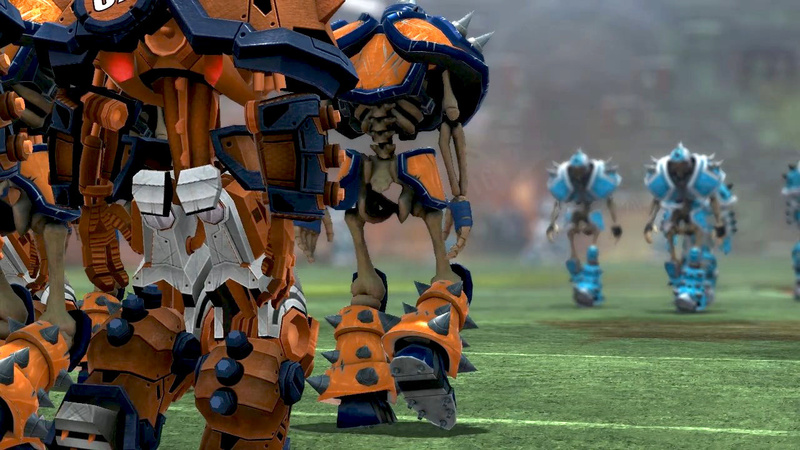 Are you happy with the confirmation of the retail release for this Mutant League Football / NFL Blitz spiritual sequel? Will you be permanently sacking quarterbacks this upcoming September? Tell us in the comments section below. The announcer sounds like the same guy from the NFL Blitz games. This looks good. While I like the presentation the rest is just too over the top for me. Hope it does well enough though. Yes this is a remake of the megadrive/genesis game. I don't really care for football/gridiron/egg chasing so I doubt I'll get this. I would be interested in the proper football (like Mario Strikers) or hockey game though. @MegaTen Yes, this and a hockey one too. They were awesome. football and hokey on the genisis were fun, but alittle messy and broken. this kinda looks the same. but if the price is a little lower from a full price title, I'll consider picking this up. I need to fill my NFL Blitz gap in my heart. @MegaTen Yes. This is the modern itteration of the same game. Got worried when i seen the headline. Where I'm from (Ireland) if something is described as "absolutely brutal" that means it's terrible. If I understood how American Football plays then this could be fun. Unfortunately I don’t so I’ll probably give it a miss. Shame someone doesn’t remake or remaster and update Speedball from the Amiga day’s for the switch. Universally understood gameplay. Absolutely excited. Rather have this than Madden anyway. @MegaTen that’s the one! You’re thinking of Mutant League Football. @Pablo17 spot on! Its none other than Tim Kitzrow - the voice of NBA Jam / NFL Blitz! This video completely turn me off this game. Am I seeing this correctly? It's like 5 seconds of gameplay ending in a tackle, then some mutant talking, a table and back to 5 seconds of gameplay? It doesn't look too exciting. I don't really know much about American football, but if it's interrupted every minute or so in reality Americans lost the right to talk crap about soccer. Give me the turn-based Blood Bowl instead. Yeah, the turns in that are also short, but they don't feel like they end before it gets interesting. It's not the same without Bones Justice. Never really cared for sims, but I love a good arcade sports experience, especially Blitz. Played a lot of this on Genesis, so I’m definitely interested. Having loved the mutant league games on genesis, I picked this up on PC when it launched, and it was disappointing to be honest. It plays like a really bad NFL Blitz clone, and there's way, way too many stops in between plays. I'd say watch some gameplay online before dropping money on this, it might not be what you were expecting. Looks like a mix between Bloodbowl and an old Atari Jaguar game I had called Brutal Sports Football. @Laxeybobby It's actually a very simple game made to look complex. Two teams of 11 take turns moving an oval shaped ball down the field to the "end-zone" to score 6 points, by either running the ball or throwing to a receiver who then runs the ball, all while the opposing team attempts to stop them. If they make it, they get a chance to either kick the ball through the tuning fork thing ("goalpost") for an extra point, or attempt another play to the end-zone for 2 points. If they succeed at either, their drive ends and they kick the ball down field to the other team. If they fail, their drive ends, and the other team starts their drive in the opposing direction from the yard line of failure("line of scrimmage").They have 4 chances("downs") to make it, but if they accumulate 10 yards, they get another set 4 downs("1st and 10"). If they can't make it to 10 yards by the 4th down, there's the option to punt the ball down the field for the opposing team to start their set of downs("drive") in the opposite direction, fake a punt which is a rare and risky decision, attempt another play if they are close enough to the end-zone(or are desperate for a new set of downs), or attempt a field goal worth 3 points - which entails a teammate kicking the ball through the goalpost - this play only works if the kicker is good enough or the team is close enough to the end-zone at 4th down. Meanwhile, the coordinators from the sidelines are engaged in a game of strategy trying to figure out which play the other team is going to attempt, to hopefully thwart the opposition's efforts. TL;DR - American Football is essentially an overly complicated game of backwards Tug-O-War with an egg ball, and the sponsors use all of the breaks in between plays to bombard our country with advertisements - usually for beer, junk food, automobiles, and more recently, video games. The original was pretty much the only sports game I seriously bothered with when I was a youth...but I'm not nostalgic. It's nice that it doesn't take itself too seriously and I hope it finds an audience, but I won't be a member of it. @onex That sounds fiddly indeed. But at least it seems to make some sense, unlike baseball. it is simply an ugly port of blood bowl !!! @MegaTen Yep, it had Soccer ( Football ), Football (American Football ), and Hockey. Why can't they just make a reboot of Tecmo Bowl? It's time for a new one. Games like Super Mega Baseball are proof that real teams and players aren't needed. Just a good game of Tecmo Bowl will sell. Do they not want to make money? @blockfight I'm in the US and I thought the same thing. @onex Thanks for the explanation. The ‘Plays’ that appear for selection also appear that you need knowledge of the game to understand them and use them properly. Anyway having read your post I now know the basics. @Laxeybobby yeah, they are essentially team formations, certain colors meaning a running play, others a ball passing play. But I think this game has silly, made-up plays involving chainsaws and other craziness. @macaron75 No, it plays absolutely nothing like Blood Bowl. It isn't even a turn-based game. It's a spiritual successor to Mutant League Football on the Sega Genesis, and plays like a mixture of that game and NFL Blitz. @JJ286 Not a "trash game" at all. Look at the user reviews on Steam, or YouTube. It will be nice to have a good football game for the switch finally. If it plays as well as it looks I will definitely be picking this up. Now all we need a need is a good hockey game.